Ebbin for Virginia – Vote Two Weeks from Today! I hope you will join me in supporting Adam Ebbin in his candidacy for the Virginia State Senate. An eight-year member of the House of Delegates, Adam has the experience and knowledge we need working for Northern Virginia in the Senate. I am supporting Adam because I know he is the candidate who will stand up for our local priorities and ensure that our state government provides for the needs of every Virginian. In the Senate, Adam will work to ensure that veterans returning home from war have the support they need to find a place in our workforce, including a statewide database that will bridge the connection between veterans and local employers. Adam will also continue to be a fierce advocate for our public schools so that every child in Virginia has a chance to achieve their full potential. The Democratic primary for the 30th Senate District is on Tuesday, August 23rd. Whether you vote on Election Day, or cast your ballot early, please join me in voting for Adam Ebbin. The stakes in Richmond are too high to not have his experience, knowledge and dedication continuing to be working for us in the General Assembly. Additionally, with less than a month to go before Election Day, your support of Adam’s campaign means more than ever. Help me send Adam to the Senate where he can continue to be an unwavering voice on behalf of our shared values. I gave $50 last week and encourage you to give what you can. 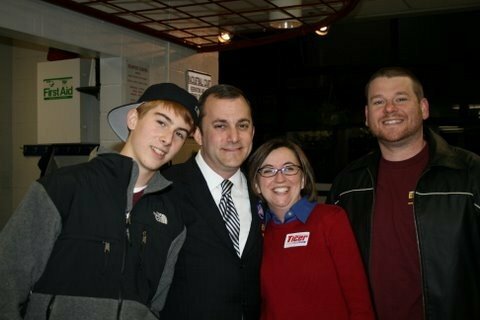 My Brothers & I with Adam Ebbin on Election Day! Become A Friend of Art on the Avenue TODAY! Hard to believe it is August! That means, it is time to think about the delights of Fall! A signature event for the Washington region is Del Ray’s own Art on the Avenue, a multicultural arts and music festival. On October 1, 2011, from 10 AM to 6 PM, Mt. Vernon Avenue will be transformed into a street festival of crafts, food, music, fun, and activities for the whole family. Plan to spend your day with us. Do some early holiday shopping, partake of some great ethnic food, let the kids enjoy crafts and music, and just people watch! Your patronage and support have made the first Saturday in October in Del Ray a Metro area tradition. Over 50,000 attended last year, enjoyed the food from local restaurants, and shopped from more than 300 craft vendors and artisans. Art on the Avenue happens because of the hard work of dedicated volunteers and the financial contributions of local individuals and businesses. We need you to make this fun-filled day happen. We are asking you to join the effort by becoming a Friend of Art on the Avenue. You love music — we pay the performers who entertain you. We buy all the children’s activities supplies so that kids can participate in art for free. We advertise and get the crowd out so that we can introduce our great community to more new folks each year. And we provide all that is necessary for a safe environment for everyone for the entire day. The form for you to sign up can be found HERE. Let me know how you can help and how I can get in touch with you. I hope you will join Friends of Art on the Avenue. You won’t be disappointed because you will know that your support is helping to produce one of Alexandria’s signature community events for 2011. P.S. One thing we always need help with is clothes for scarecrows. If you have any long sleeve shirts or long pants, please check the appropriate place on the attached form.